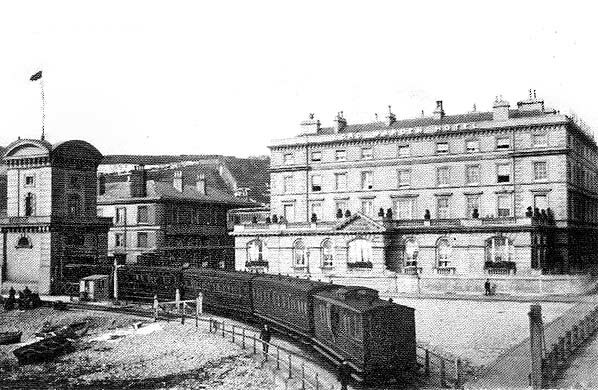 A train has just left Admiralty Pier and is heading towards the Town station circa early twentieth century. The Town station is seen to the left of the hotel and the high level bridge linking the two buildings can be seen. The building on the far left is the Dover pilots tower. This built in 1848 to replace the pilot's station on Cheeseman's Head that was demolished to make way for the South Eastern Railway track. When the line to Admiralty Pier was built the tower was in the way and, rather than replace it the ground floor was gutted to allow trains to run through it!.